Introducing the reduce Vacuum Insulated Wine Cooler. This unique wine cooler combines sleek style with functional features. The dual wall vacuum insulation keeps wine at the perfect temperature for hours. The convenient ergonomic shape, featuring a non slip base creates a sleek silhouette that is easy to hold. The sweat proof body allow you to enjoy your drink without condensation. Bring them to any outdoor even such as: Park Picnics, Camping, Pool, Beach, BBQ, or any weekend trip or vacation. 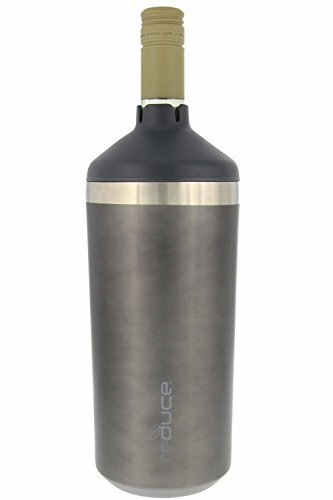 It is composed of 18/8 stainless steel & 100% BPA-Free materials that do not retain odors. Hand washing is recommended with mild soap and water. Makes a great gift for any occasion or person in your life: birthday, anniversary, holiday, men, women, etc. If you have any questions about this product by reduce, contact us by completing and submitting the form below. If you are looking for a specif part number, please include it with your message.